Creating new WordPress web pages is one of the simplest ways to build and add content to your website. Web pages are also the main building blocks of your website. They add structure and framework, and as such are used for important content which doesn’t change very often. Pages should not be confused with Blog Posts which are constantly being added to and displayed in a predefined sequential order. Think of pages as the cornerstones of a building, solid, reliable and always there. So now we understand the basics, let’s get to grips with how to add new website pages and insert them anywhere on your website. It’s a basic skill, so let’s get started. 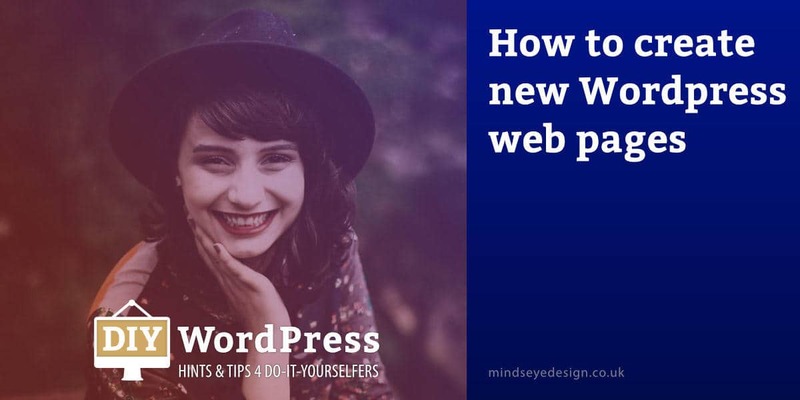 This is the easiest way to create new WordPress web pages for your website. It’s not complicated and will only take a minute or two. First of all, you need to login to your WordPress admin area. Once logged in, follow the simple steps below. First, in your Dashboard, hover over the Pages module in the Sidebar on the left-hand side. See image below. Click on the ‘Add New’ option in the fly-out menu that opens. The ‘Add New Page’ screen opens, with all the tools necessary to create your new page. 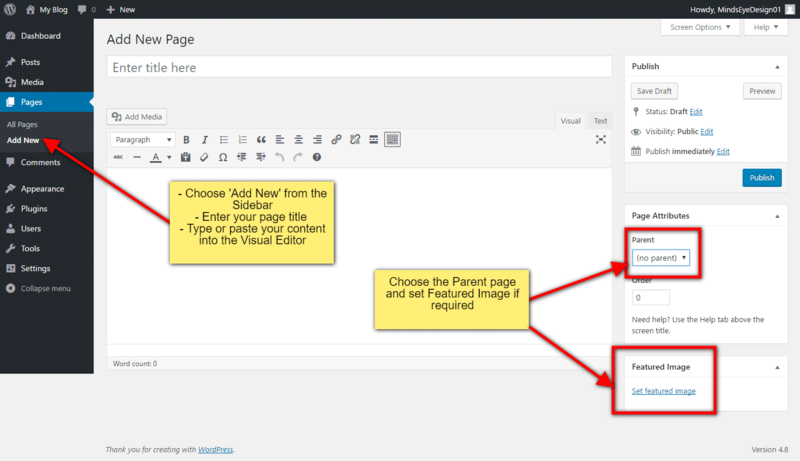 Note: The most important elements used when creating a new page are the Title, the Editor, and the Publish module. Other options on the ‘Add New Page’ screen, which we have not covered here, will be covered in more detail in other ‘WordPress Help’ posts. The first thing you need to do is to enter your page title, in the field above the Editor which says ‘Enter Title Here’. Now click your mouse (place your cursor) in the Visual Editor box and type or paste your content into it. Click the Save Draft button in the Publish module in the right side column. Tip: If your new page is a sub-page, you can choose the ‘parent’ page in the ‘Page Attributes’ box to the right of the Editor. …You’ll want to check how the new page looks on your website, and therefore how it will appear to the rest of the world. To do this, click on the ‘Preview’ button in the Publish module in the right side column. When you’re happy with how everything looks, click on the blue ‘Publish’ button to publish your new web page to your website. As always, if you have any questions, let us know.